I live in a bog-standard semi-detached house in the middle of a long row of similar houses in the centre of Banstead, when we moved in thirty years ago I was chuffed to find that our house was blessed with several House Martin nests. Not only that but most houses in the street had nests and although a few misguided homeowners seemed to enjoy knocking down the nests as the birds were building (they make such a mess you know) most appreciated their presence. One of the highlights of the year was the anticipation of their reappearance in the spring and summer evenings sitting in the garden were enhanced by watching these birds together with Swifts hawking insects overhead. Alas no more, the number of nests dwindled over our first ten years here until one spring none appeared, a sad year (around 1992). I also witnessed a similar pattern around my parents home in south London. Apparently this was a reflection of a much wider decline across much of northern and central Europe since the 70s. Obviously one wondered why! To quote from the RSPB page devoted to the species and addressing the decline: "They require rain to produce wet mud for nest building and for encouraging the abundance of insect prey, but cold weather prevents them feeding Large-scale mortality is regularly recorded during and after periods of bad weather, during both breeding and migration. On the other hand, hot and dry weather can result in mortality though dehydration and heat stress." This seems to suggest that climate change may be the important factor. I had always wondered where they found mud for their nests locally because there was/is precious little surface water or muddy ponds locally but I am not aware that anything has changed there. In addition, at spring and autumn migration there are still plenty of birds passing through, just not stopping! My opinion (of course I have to have one) is that their food source (flying insects) has dried up. Bats, Swifts and Spotted Flycatchers have all shown a similar decline in this area, is it just coincidence that they all have the same diet? Of course you have to then address the disappearance of insects: climate change or farming practice? Watch this space! 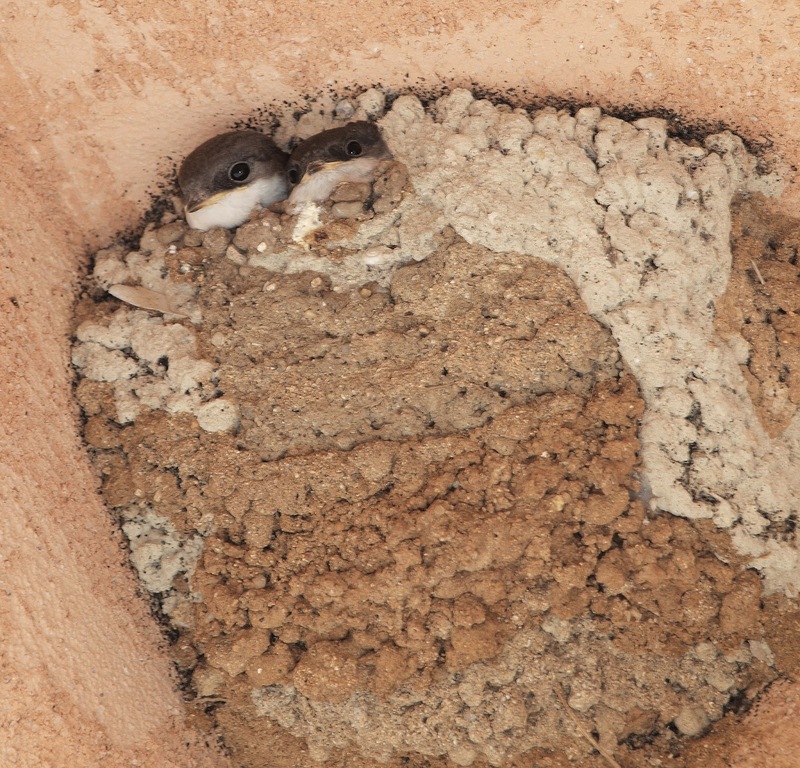 I had to include a picture of a nest, unfortunately not taken locally but in the Mediterranean where thankfully, there are still large numbers of House Martin and their presence on buildings are more than tolerated and there are still a lot of insects (although that is changing year by year in many places). Great to have you back posting John - and I like rants! House Martins over on my side of Banstead are purely passage migrants now, and even then in small number. Thanks Steve, perhaps my general mood will improve but I doubt it!! I am not aware that anything has changed there.